Head and neck cancers account for approximately 3 to 5 percent of all cancers in the United States. According to the National Cancer Institute, more than 55,500 new cases of head and neck cancer were diagnosed and approximately 12,598 people died from the disease in 2009. Most head and neck cancers begin in cells in the moist tissues that line the hollow organs and cavities of the mouth and nose, including the lips, tongue, gums, sinuses, naval cavity, pharynx and larynx. What is molecular imaging and how does it help people with head and neck cancers? 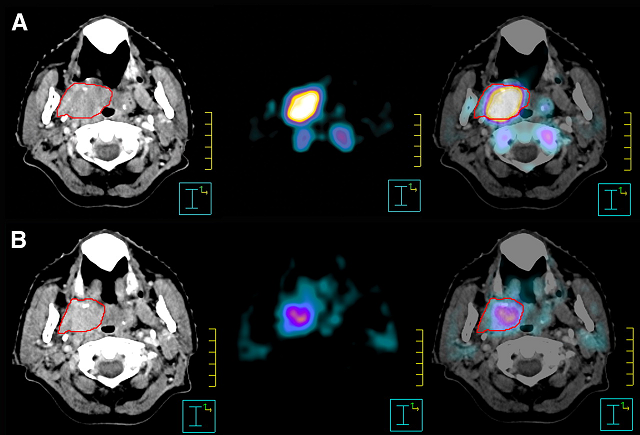 The most commonly used molecular imaging procedure for diagnosing or guiding treatment of head and neck cancer is positron emission tomography (PET) scanning, which is often used in conjunction with computed tomography (CT) scanning. How is PET used for head and neck cancers? (L to R) CT, 18F-FLT PET , fused 18F-FLT PET/CT scans of a patient with an oropharyngeal carcinoma before radiation therapy (A) and after (B) Significant tumor volume is seen in PET/CT scans.